The conduct of free and fair elections is often used as a medallion for burnishing a country's democratic credentials. This is to be expected since elections have that peculiar property of being a self-fulfilling prophecy: the conduct of an election often justifies the future conduct of elections. Every five years India hosts the largest general election in the world. The national news and discourse, while dominated by exit poll predictions and political machinations, will inevitably feature one or two quaint stories about officials operating polling booths in some remote part of the country - often for handfuls of voters. The specifics of the story vary from year to year but the underlying message is always the same - universal adult franchise is a cornerstone of our democracy and must be celebrated. The movie Newton features one such story. A principled election-duty volunteer is tasked with operating a polling booth in the middle of a Naxal-dominated jungle for merely 76 voters. Whether he succeeds and the travails he faces in his line of duty form the meat of this movie. 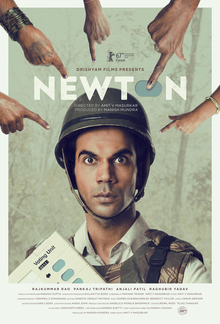 Rajkumar Rao's character, Newton Kumar, is one-dimensional; he is brutally honest, principled to a fault and aggressively bound to his duty. This black & white character, bordering on caricature, stands in stark contrast to the gray dominion of Dandakaranya Forest, the stage for a long-running conflict between Maoist insurgents and security forces of the state. In this verdant jungle the lines of oppressor and oppressed shift and blur on a day to day basis. The character's rigid exterior serves as a compass while navigating this nebulous setting. The 'system' is represented by the character of Assistant Commandant Atma Singh (AC). Despite his spiritually rich first name, the AC is a thick-skinned realist and a cynic. He distrusts the tribals - the historical residents of the forest - and doesn't hold them capable of appreciating adult franchise. The clashes between these characters bring to bear a number of uncomfortable questions about adult franchise in these remote parts. The tribals are caught between forces they cannot control. The state wants them to vote, the insurgents don't. The insurgents surround them, but the state is everywhere. They are too few to be of interest to political leaders and too poor to be of interest to most media. The leaders speak about foreign things (infrastructure growth and foreign direct investment) and in a foreign language (Hindi). Is it really freedom of choice when the only choice is between different levels of grime on green buttons in a voting machine? Why should we celebrate the active presence of the state once in five years in these remote parts? Shouldn't the state be present every single day offering essential services such as education and healthcare? By calling attention to the one-off occurrence of elections as evidence of democracy, aren't we also highlighting the failure of democratic governance in making these remote parts more hospitable to the pursuit of a good life? The movie does not answer these questions. However, there is one key scene where the movie ventures to speak out. When Newton and his colleagues are returning to their camp after disbanding the polling booth, they meet four tribals seeking to vote. The AC and his team shoo away the villagers; Newton loses it! He grabs the nearest gun to hold the AC hostage and commands his colleagues to setup an impromptu polling booth in the middle of the jungle for these four men. The booth is organized and the tribals vote! Four votes are successfully registered in an election with over 800 million voters. It is obvious that these four votes don't matter in the grand scheme of things. And yet, it MATTERS to those four tribals. When you are nothing more than living shades in a dark forest, being even just a canvas for election ink adds a little bit of legitimacy to your life as a citizen of India. An institution of the state of India has recognized them -- maybe just for one day, but that's still one day more than they are used to. That is the power of an institution such as universal adult franchise.